Through the universal vaccination programme, the United Kingdom has achieved elimination status for measles in 2016. This does not, however, mean that measles has disappeared in this country. Since late 2017, measles outbreaks were confirmed in five areas of England. 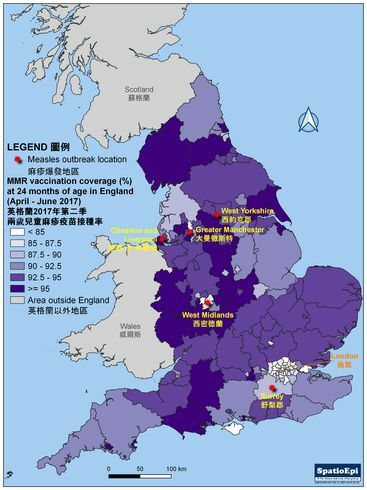 The map shows the distribution of the affected areas and the coverage of measles, mumps and rubella (MMR) vaccination at 2 years of age in the second quarter of 2017 in England. As indicated by the red asterisk, measles outbreaks took place in West Midlands, West Yorkshire, Cheshire & Liverpool, Surrey and Greater Manchester. As depicted by graduated colours, coverage of MMR vaccines in the neighborhood of the affected areas was generally lower than that in the other parts of England. 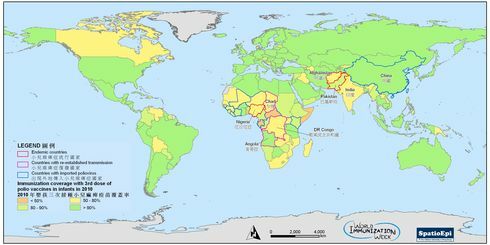 Apparently, communities with low MMR vaccination coverage are vulnerable to measles, even in a country with an overall high vaccine uptake. Measles and other childhood infections are global health problems. To encourage people to take collective effort to increase immunisation coverage for the greater good, World Immunization Week 2018 is observed from 24 - 30 April. Data for the map were obtained from Public Health England.